How Much Does Storm Window Replacement Cost? Do you have storm windows that are in a state of needing to be replaced? Maybe you have old storm windows that are showing signs of wear and tear. Or, maybe your current storm windows aren’t adequately protecting your home from the elements? Perhaps you are looking for a particular style or brand of storm windows? There are many advantages to storm window replacement. First off, replacing your storm windows is a cost-effective and affordable home improvement project that won’t require major home renovations. Consider the alternative: expensive complete window replacement. Additionally, having properly installed storm windows will improve your home’s energy efficiency and will not require a complete home overhaul! This is simply because sealing your windows will prevent air from leaking into or out of your home. Plus, properly installed storm windows are likely to fit over your home’s existing interior or exterior windows, and the replacement process is relatively quick. Regardless of the reason why you are in need of storm window replacement, you should make sure to hire a knowledgeable professional who is able to complete your job on budget and on time, and in a manner consistent with your vision. How Much Does It Cost To Replace Storm Windows? The time it would take to replace your storm windows. Type of storm windows you want to be installed. 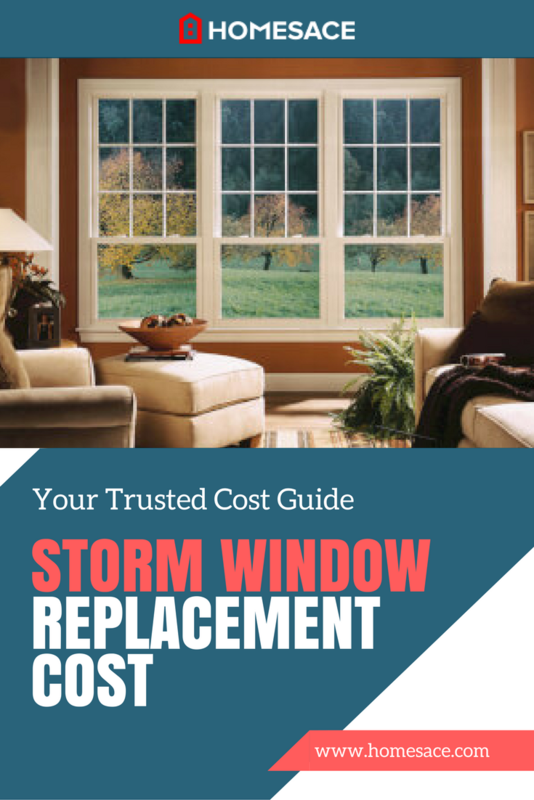 In addition, there are extra costs that you may need to factor into your overall cost to replace storm windows. If your unique project requires them. Extra supplies, additional manpower, special materials and renting specialty equipment are all possible costs that may apply to your storm window replacement job. Keep in mind that storm window replacement jobs include removing your old window or windows, repairing and adjusting the exterior window frames, caulking and then positioning and securing the window. A homeowner in the U.S. can expect to pay anywhere from $170 to $300 for a typical storm window replacement job. The average cost most homeowners pay in the U.S. to hire a storm window replacement professional is $230. When you have storm windows that are properly sized, sealed and secured, you can enjoy reduced heating and cooling costs. These reduced costs can add up and cover the initial cost to replace storm windows. Also, if you replace your current storm windows, you may also notice less outside noise as storm windows also act as insulation. Not to mention, there are many options in terms of style and size that can certainly increase the exterior curb appeal of your home. Would you like storm window replacement at a fraction of the cost? Simply enter your zip code in the space provided on this page. You can receive quotes from professional installers in your local town or city. It's 100% FREE and there's absolutely no obligation to hire, purchase, or sign a contract.